Thanks to Prof Paco for his Ejs Open Source Earth and Moon Model and implementing Ejs and Java3D. The orbits are just illustration and does not contains physics newton's 2nd law of motion. This Geostationary Satellite around Earth Model is a simple angular velocity model that uses the Java3D implementation for realistic visualization of satellite objects in geostationary orbits at three different locations namely (near Singapore, near Africa and America in model 1,2,3). Students can explore the meaning of geostationary orbits, cases of non-geostationary orbits( mode 4,5,6) and even non-physics orbit (mode 7). the file is this found C:\Program Files\Java\jre6\lib\security\java.policy. drag around the sim to find the position of Singapore. select from the drop down menu "Geostationary near sg"
observe the position of the satellite and the yellow line draw down perpendicular to the surface of the Earth surface towards the center of the Earth's core. d) relative position from the Earth surface. you may explore mode 2 "Geostationary near Africa"
you may explore mode 3 "Geostationary near America"
check if the sim is correct for each case. select mode 4 "Non-geostationary due to direction"
ii) geostationary about Earth, if not, explain why clearly in terms of a) period b)rotation spin direction c) in the plane of equator. select mode 5,51,52,53 "Non-geostationary due to angular speed"
select mode 6 "Non-Geostationary generally"
select mode 7 "Unlikely Orbits"
i) possible? if not, explain why clearly. The term Geo-stationary implies a satellite fixed about a position above the earth. This is possible because such satellites have the same period as the Earth’s rotation (T = 24 hours) and it is directly above the equator. Therefore, it appears stationary. For it to appear stationary from any position on Earth, the plane of rotation of the satellite must be in the plane of the Equator. A geosynchronous Satellite is a satellite whose orbit on the Earth repeats regularly over points on the Earth over time. If such a satellite's orbit lies over the equator and the orbit is circular, it is called a geostationary satellite. The orbits of the satellites are known as the geosynchronous orbit and geostationary orbit. There are approximately 300 operational geosynchronous satellites. Geostationary satellites appear to be fixed over one spot above the equator. Receiving and transmitting antennas on the earth do not need to track such a satellite. These antennas can be fixed in place and are much less expensive than tracking antennas. These satellites have revolutionized global communications, television broadcasting and weather forecasting, and have a number of important defense and intelligence applications. One disadvantage of geostationary satellites is a result of their high altitude: radio signals take approximately 0.25 of a second to reach and return from the satellite, resulting in a small but significant signal delay. This delay increases the difficulty of telephone conversation and reduces the performance of common network protocols such as TCP/IP, but does not present a problem with non-interactive systems such as television broadcasts..
3 added text "35 700 km fixed position of satellite relative to Planet"
4 added satellite picture from googling for images, sorry cannot track where i got it did it at midnight, if you own the picture and would like to add your credits, reply the post! added radio buttons mode =1 to 7 to increase ease of selection drop-down menu as Java 3D blocks the menu when selecting it. added axes of rotation of earth and orbit for ease of teacher explanation according to Right hand grip rule. contributed to http://commons.wikimedia.org/w/index.php?title=Special:ListFiles&user=Lookang for animated thumbnails always use 220x220 the largest that work for me. Tried 300x300 but it didn't animated in thumbnail mode. hope students learn from it and suggest what can be done more to improve it! * Tell me. I may not get it, I'm sure to forget it. * Show me. I may get it, I'll remember it for a little while. * Have me do it. I'll understand it, it may stick for a while. 2) For mode 7, can you reverse the direction of satellite's orbit so that it is rotating in the same direction as Earth? my teacher friend says that web deploy java 3d didnt show up anymore. ok i overcome this by setting number of point in Trail = 499! >> 1) can you make the equator plane more obvious? >> 2) can you show the radius of orbit for the satellite? >> 3) For mode 7, can you make the satellite rotate at the same rate as Earth? >> model. Can you correct it? > It is correct, I dont get why u say wrong. - please add a button to reveal & hide "gravitational force" acting on the satellite towards the centre of the Earth for all the modes. expanding on the non-geostationary due to speed. remove simple 3D as EJS4.3.6 supports java 3D and also a bug toggling from simple to java 3d. Students can explore the meaning of geostationary orbits, cases of non-geostationary orbits( mode 4,5,6) and even non-gravity physics orbit (mode 7). Allows for selecting what motion of Satellite is simulated. 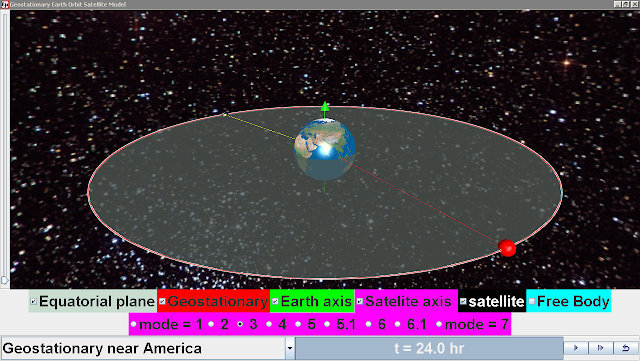 Geo stationary, for visualizing a geostationary object (RED) for comparative observation with the other modes. Show text: 35 700 km fixed position of object relative to planet eart. 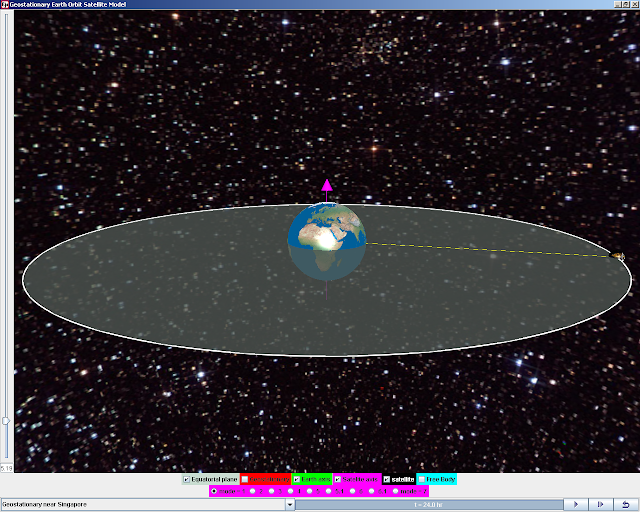 The Geostationary Satellite around Earth Model was created by created by lookang (based on a earlier model Francisco Esquembre http://www.phy.ntnu.edu.tw/ntnujava/index.php?topic=1830.0) by using the Easy Java Simulations (EJS) version 4.3.6 authoring and modeling tool. An applet version of this model is available on the NTNU website . Shout our thanks to the Ejs community namely, Francisco Esquembre , Fu-Kwun Hwang and Wolfgang Christian for their professional learning community support. You can examine and modify this compiled EJS model if you run the model (double click on the model's jar file), right-click within a plot, and select "Open EJS Model" from the pop-up menu. You must, of course, have EJS installed on your computer. Information about EJS is available at: http://www.um.es/fem/Ejs/ and in the OSP comPADRE collection http://www.compadre.org/OSP/. removed radio buttons, only menu drop down now. forces check-box text as "Free Body Diagram"
earth disappear when Free Body Diagram is selected to allow visualization of point mass forces acting on them. 1) can you make the satellite in mode 6 orbit with period = 24 hours? added a new polar orbit with T = 24hours. 2) The "Show Text" button doesn't seem to work. it is removed as there is a problem in Java3D implementation as the text does not move with he satellite. we can add it in after EJS can generate the code correctly for Java3D. 3) The simulation 'hangs' after it is being played for some time. The whole thing just stops and I need to close the window. geostationary show is a bug, toggle the button should be fine. 1) but the geostatioary path still appears, even when the geostationary satellite is unchecked..
try to un check and check, it should work properly. 2) The simulation still hangs after 2 or 3 minutes. agree, Ejs4.3.7 produce this bug, i have revert to Ejs4.3.5 and it seems better now. 3) No way to solve the "maximise screen" problem? 1) there are two sets of mode 5 and 5.1. The first set is wrong and need to be removed. Thanks. 2) the sim still hangs after a while. This bug will affect the pace of learning if it is not resolved.